Welcome! Rebecca and I worked very hard on this concept and list. Before creating it, we searched high and low for a similar list and found absolutely nothing. Within weeks of posting our lists, we began to see lists with the same title pop up on various blogs and social networking sites. Unfortunately, there are several blogs that did not link or credit us. Please help us keep the integrity of the book blogging community by crediting our blogs and/or using our logos to help spread the fun in an honest way. We encourage all book fans to create their own lists, but request, once again, that you link us up. Like I said, we worked very hard on this concept. In March, Rebecca @ Love at First Book and I came up with the idea for a bookish bucket list, which we titled 50 Bookish Things You Must Do Before You Die. What’s different about our list is that it has nothing to do with reading any particular books, but rather taking bookish actions. We had 35 goals in common and 15 individual goals. Together, we have helped each other work our ways through some of the items on our lists, so below is an update. The ones that I have started or completed are bolded in blue with details below. Beginning recently, I’ve met Brad Meltzer, Eli Saslow, B.A. Shapiro, and a few others who I can’t remember right now! I MADE IT IN THE NY TIMES! So far, I have Colorado, Florida, Georgia, Maryland, Massachusetts, New Hampshire, New York, North Carolina, South Carolina, South Dakota, Tennessee, and Virginia. I bought a classic Rudyard Kipling! I’ve read a few collections, but for the most part I’m not loving them. I hope I find some good ones! So Rebecca and I are challenging YOU! Create your own bookish bucket list! Can’t think of 50? Think of however many you can! Feel free to take my logo (above) or Rebecca’s logo and create your own 50 Bookish Things You Must Do Before You Die! Just make sure to link it back to The Book Wheel or Love at First Book! Then share it with us!!!!! 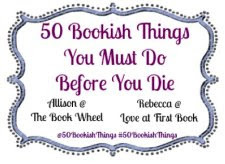 And check out Rebecca’s list of 50 Bookish Things You Must Do Before You Die! Already have a list? Leave it in the comments! Want to make a list? Do it! Just link us up, please! Click here to link up. “Five Days At Memorial” – Institutional Failures? What Do You Think? I’m Shruggin’ ‘Atlas Shrugged’!